Have a question for Hanuri Pension? Whether you're a tourist or traveling on business, Hanuri Pension is a great choice for accommodation when visiting Namhae-gun. Situated only 14.0 km from the city center, guests are well located to enjoy the town's attractions and activities. Visitors to the hotel can take pleasure in touring the city's top attractions: Gacheon Daerangi Village, Imjinseong, Boriam Temple. 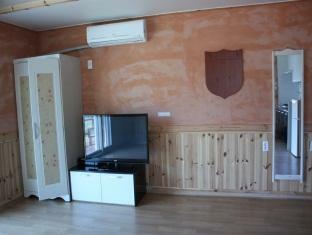 Hanuri Pension also offers many facilities to enrich your stay in Namhae-gun. Guests of the hotel can enjoy on-site features like car park. 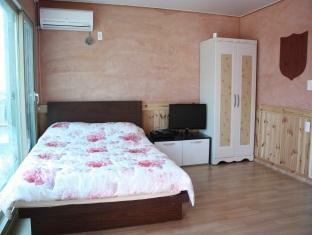 Hanuri Pension is home to 12 bedrooms. All are tastefully furnished and many even provide such comforts as television LCD/plasma screen, air conditioning, balcony/terrace, fan, internet access – LAN (complimentary). Besides, the hotel's host of recreational offerings ensures you have plenty to do during your stay. Hanuri Pension is a smart choice for travelers to Namhae-gun, offering a relaxed and hassle-free stay every time. Very pleasant and a refreshing get away from city life. This was our first time at a pension and I was pleasantly surprised. There are many pensions in Namhae and we passed many as we were driving to our location. This pension is located on top of a hill and so was a little less accessible than the others but because of this it was more isolated and private. There was a nice picnic bench outside of each pension. The manager was very nice and informative and even brought us extra blankets. There was free parking available. The only negative was that the pensions are close together so we could hear what was going on around us at night. Mr Lim and his wife run a wonderful pension. The rooms are bright, modern, airy and clean. Their hospitality is warm and caring and they go out of their way to make visitors comfortable. The setting is peaceful and really beautiful, set among the rice paddies and market gardens a short walk form the sea shore. A perfect place to savor the natural beauty and tranquility of Korea. Buchten diese Pension für einen Besuch der Expo. Dafür ist die Lage perfekt (Hafen mit Fähre nach Yeosu ist 10-15 Auto-Min. entfernt), um nach dem Trubel der Großstadt Seoul bzw. der Expo zwischen Reisfeldern zu entspannen. Ansonsten befindet sich in dem kleinen Ort leider nichts. Taxi von Nöten (es gibt auch eine Bushaltestelle, allerdings wird diese nur selten angefahren). Besitzer sind sehr hilfsbereit, der Mann spricht englisch. Zimmer sind ondol, sehr sauber und haben neben einer Küche auch einen Balkon bzw. eine Terasse. 침대가 없는 온돌인데 요가 너무 얇아서 편안한 숙면을 기대할 수 없음. 두터운 요 비치가 필요함. 입출입로가 너무 위험하고 주차 시설이 약간 빈약한 편. 바로 아래에 축사가 있어서 약간 악취가 남. 아무 기대안하고 그냥 저렴한 가격에 1~2박 하고 싶은 이에겐 추천.